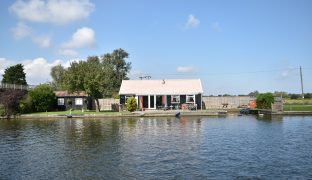 A spacious and immaculately presented detached riverside bungalow in a convenient location, with panoramic views, three double bedrooms, 110ft of private quay headed river frontage, generous mooring dock and a south facing aspect. 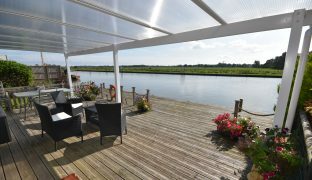 A spacious and immaculately presented detached riverside bungalow offering impressive far reaching views, three double bedrooms, approximately 110ft of private quay headed river frontage, a generous mooring dock and a south facing aspect. 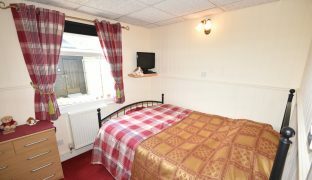 Other features include UPVC sealed unit double glazing, LPG central heating by radiators, a wood burning stove and updated/improved kitchen and shower room. 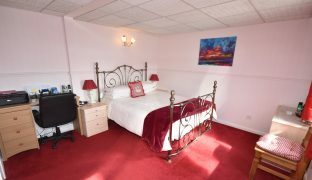 The generous accommodation consists of a dual aspect south facing 20ft long living room, fitted kitchen with built in appliances, master bedroom with large walk-in wardrobe, offering potential to be converted into an en-suite shower room. 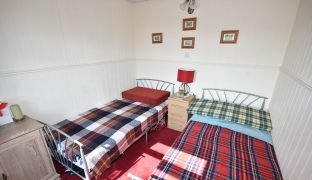 Two further double bedrooms and a shower room. 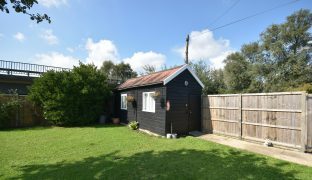 As the very first property on the Hickling Bank, this bungalow benefits from being very easy to get to, and is less than 100 metres away from a private car parking space, which is available by separate negotiation. 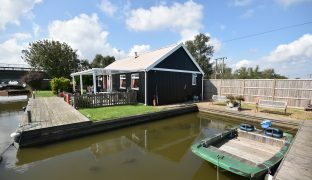 With spacious accommodation, unspoilt panoramic views and an incredibly convenient location, this is one of the best examples of the River Thurne bungalows. 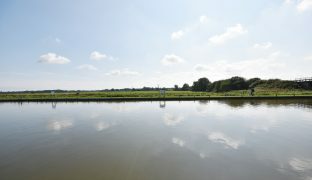 Ideal as a stunning second home or a perfectly placed holiday let. 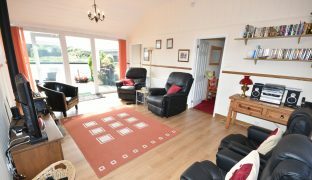 Spacious, dual aspect living room with large picture windows and a patio door looking out over the river and the open countryside beyond, and window to rear with views out over open farmland. 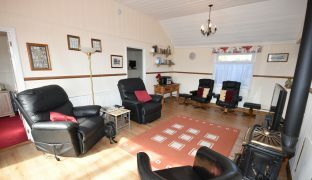 High panelled ceiling and panelled walls, laminate wooden floor, wood burner with stove hearth, two radiators, dado rail and access to loft space. 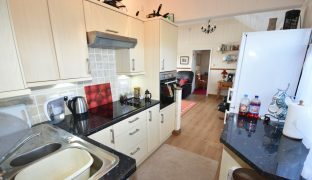 Range of wall and floor mounted storage units with 1½ sink unit and drainer, panelled ceiling and walls, built in oven, hob and extractor hood, tiled splash backs, laminate wooden floor, partially tiled walls, window to rear with views out over open farmland. Low level w/c, wash basin, double shower enclosure, window to side aspect, radiator, partially tiled walls, laminate wooden floor, down lighters, built in boiler cupboard and a panelled door. 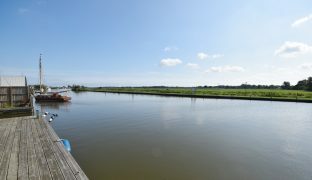 Window to front aspect with picturesque river views. 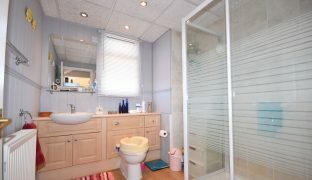 Radiator, dado rail, wall lights and a large walk in wardrobe/dressing room offering excellent storage with the potential to be converted into an en-suite shower room. 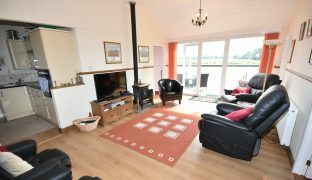 Window to front aspect with river views, radiator, panelled walls and dado rail, panelled door. Window to side aspect, radiator, panelled walls and dado rail, wall lights, panelled door. 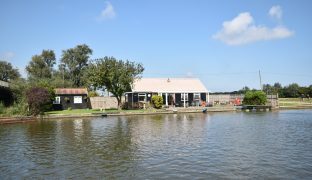 An impressive plot, one of the largest on the River Thurne, extending to approximately 110ft, and includes a generous private mooring dock which measures 30’0″ x 17’6″ with outside power, and lighting. 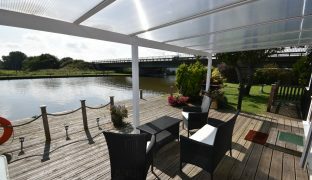 Leading out from the living room is a large south facing sun deck partially covered by a glazed UPVC canopy, the perfect spot to sit and enjoy the far reaching views. 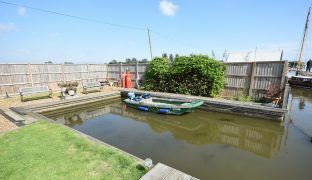 The rest of the garden is laid to lawn with mature trees and shrubs, enclosed by panel fencing with a gated entrance and a large shed with power and light connected along with plumbing for a washing machine. 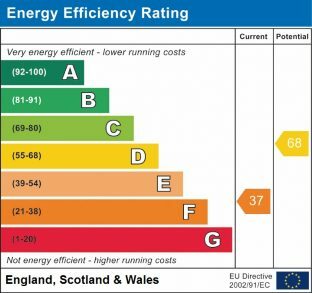 The property benefits from UPVC fascias and guttering and we are advised that the exterior was repainted in 2017. 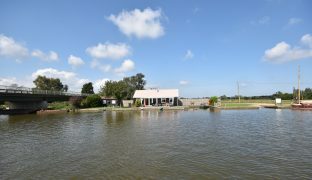 This property is the very first on the Hickling bank and is only a few hundred metres from the centre of the village with all of its facilities. 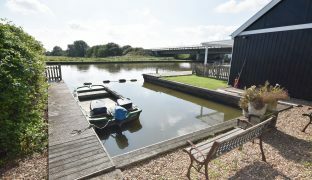 Although access is by footpath or river only, a private leasehold parking space is less than 100 metres away (available by separate negotiation).